Designed to open into a room or out onto a deck or patio, patio doors make a dramatic statement in your home. Blurring the lines between the indoors and outdoors, patio doors are a great source of natural light and add superb ventilation. A sliding vinyl patio door slides smoothly back and forth making it a great addition to a room without expending any space. A French door adds elegance and makes a statement. Available in traditional and contemporary styles, Tree Court Builders Supply offers a wide variety of styles to choose from. 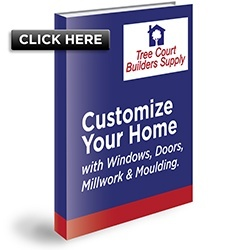 Tree Court elevates your home’s interior and exterior with custom replacement vinyl patio doors. Discover which door – sliding or hinge is best for you and transforms your space. Shop custom styles, interior colors, exterior colors and woodgrain finishes grid patterns and hardware finishes. From superior performance and easy glide operation to beautiful style options that offer the design features you want; the Tree Court door will enhance your home and help you to welcome the outdoors. We want your patio door shopping experience to be amazing. Whether you choose a French door design style or a more contemporary look, the team at Tree Court will guide you through the selection and purchase process with ease.